A traditional favorite for all-occasion gift-giving, these jumbo cashews are also one of our long-time bestsellers. Buy several to give as gifts or to have on hand when family and friends visit. Available in 18 oz. stay-fresh tins. Cashews, Peanut Oil and/or Canola Oil and Salt. Manufactured on Equipment that also Processes Peanuts, Tree Nuts, Soybean, Wheat and Milk Products. Contains: Cashews and Peanuts. The cashews were a Father's Day gift for my Dad. He was delighted as he always is with the quality of the cashews. He was planning his consumption to make the cashews last for as long as possible. He is a very happy recipient of "the best cashews in the world!" There are no better tasting cashews than VA Dinner's. I love them! A bit pricey but I am willing to pay for the difference in taste and freshness. Large and totally delicious. You have to be careful because once you open the can it is hard to close it until it is empty. These are the best cashews anywhere around. The only ones I buy now and we'll worth the price. Fast shipping. I'm a long time customer. I started purchasing for my Grandpa who loved the pecan candies and cashew. Now, I buy for my Step-Dad who munches on the cashews on long drives. Along the way, my family has become addicted to the Old Bay and the dill peanuts. YUM! What a pleasure doing business with Va Diner. Being Native Virginians it is always so refreshing and convenient to order from a great Southern company. We enjoy everything we order from you. Every other company could take lessons from you all about Southern hospitality. Thanks for making us so happy. I must warn anyone who tries these cashews. Compared to most brands these have a good crunch too them and fantastic flavor. Wish they had a dry roasted version but these are still incredible. If you do buy you may wish to be 2 or more cause its hard to put these down. There is not much to say about Virginia Diner, except all their products are superior to others selling the same products. 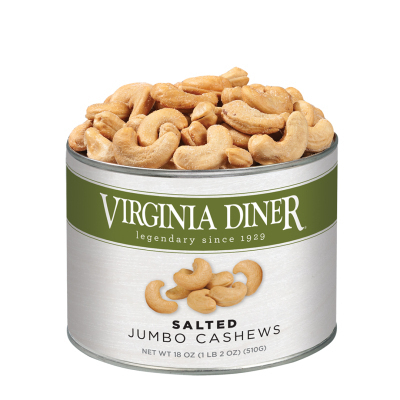 If you looking for best cashews, look no further than Virginia Diner. The cashews I ordered came in much more quickly than I planned for. Thanks! These are the best cashews I've ever had. I have ordered from VA Diner for many years and always been very pleased. I had to call this year to double check on an order since though I thought it had been delivered I was not aware initially that it was sent in the mail. I was very pleased with the timely response from customer service about the delivery. I send cashews to my son every year though am very sad that his favorite item was discontinued several years ago.....the cashews with the "hard shell" wasabi coating. Keep hoping these will be added back!!! Though they sound like an odd favorite.....my son is a sushi lover and these were his favorite. Once you start eating them you cannot stop. I do miss this item. Though as I stated, I am always very pleased with the services of the VA Diner and like ordering items from Va as a gift.